We here this alll the time “never give up”. Such simple words yet such a hard task. Giving up is always running through our mind. Since as early as I can remember giving up was always an option. Sometimes even encouraged by our competition. 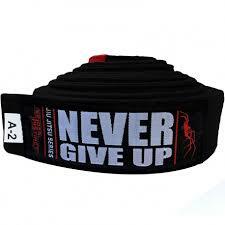 In Jiu Jitsu giving up is always an option and sometimes you will give up. It maybe during a training session or a match. Don’t freak out it will happen mentally 1000 times. The question is what will you do when that option is presented to you. Will you cave and quit? Or will you drive on and finish what you started? The truth is you will quit at some point in your BJJ journey. What I will tell you is do not make an an excuse as why you quit. Own it and accept it and once you have done that never let it happen again. Now it can’t be that simple can it Ray? Yes it is that simple. Our trials and tribulations make us who we are as long as we are willing to own them and make sure they don’t happen again. So next time you feel like quitting don’t, force yourself to push past that feeling. Your mind is stronger that your body I promise. Even if you don’t win you can walk off the mat and say I didn’t quit. That experience alone will build you into a stronger person. The next time you quit and you will. Don’t make excuse or blame people for your shortcomings. Own it and identify why you did it and fix it. We are designed to be tested and pushed. Let jiu jitsu help you push past those shortcomings.